Rajput history as we know is a tale of strife. Battles were fought more for honor than for greed. Such were the times when the Rajput armies were continuously on the move. 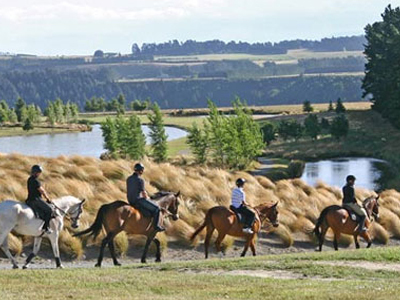 It is on these trails, past ancient Horse Safari Tour forts and temples that you will ride. Trails dotted with cenotaphs and tombstones, marking sports where valiant Rajput warriors fell in battle. Trails which take you through rural villages and nights are spent in ancient castles owned by descendants of those glorious Rajput riders. You will ride from the desert to hilly terrain, through wildlife sanctuaries and quaint desert hamlets. Evening entertainment in the form of local folk dances and music around campfire will be a regular feature. Horses will have grooms who will take charge of the animal at all halts and you will be escorted by our company guide. You will be required to wear boots and a hard hat. Breaches or jeans will suffice. Met on arrival and escorted to hotel. Afternoon, sightseeing of New Delhi. Overnight at hotel. Early morning transfer to airport for flight to Udaipur. Arrive and transfer to hotel. Evening, could go out for a ride or to the bazaars. Overnight at hotel. 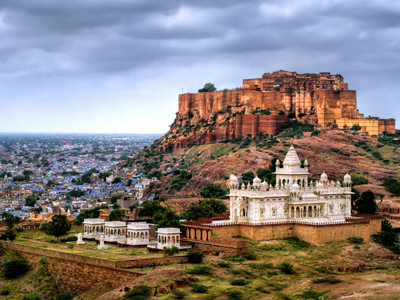 Depart by road ex- Jodhpur through semi desert country, passing the textile town of Pali, we head towards the foothills of the Aravalli ranges. We arrive at Kotri Rawla for lunch (2½ hrs) . Kotri Rawla is the 200 yr. old residence of the Thakurs of Kotri. The village also houses the stud farm, which provides the horses that you will ride. We acquaint ourselves with the horses and ride 4 km to Nadol, an archaeological site with ruins of the 6th century being excavated now. Kotri and overnight at the Rawla. ( Evening entertainment - Dancing stallion). 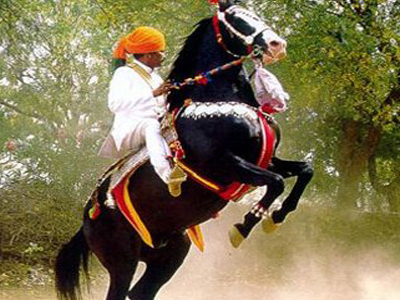 Ride out through open country and rocky outcrops to Surajpura and visit the Marwari stud farm (6 km). Continue after refreshments to Rawala Narlai ( 4 km ). Lunch. Rawla Narlai is also an old property but has been exquisitely renovated to provide all modern comforts, yet retaining the old charm. Climb the solid granite hills to the temples at the top which have a commanding view of the surrounding country below. Later, take a bullock cart ride to an old stepwell out in the country for dinner around a campfire. ( Musical entertainment ). Ride (15 km ) past farms cultivating rapeseed, cotton, wheat etc. to a large lake , Muthana, for a picnic lunch. There is abundant wildlife around the lake. Get into Jeeps and drive 10 km to Maharani Bagh Orchard Retreat. ( Those who wish to ride may continue on horseback, but will have to rush to visit the Ranakpur temples). The Maharani Bagh is a beautiful cottage complex owned by the Maharaja of Jodhpur. After checking in, we drive across the famous Ranakpur Jain temples nearby. Built in the 1460's, the architecture of these temples is awe inspiring, with every inch of pillar and ceiling intricately carved so that no two pillars are alike. Return to the cottages for an entertaining program by a local magician around the campfire. Overnight at the cottages. Today, we ride through the Aravalli hills. We follow a jungle track in the sanctuary, which is home to panthers, bears, wolves, sambhar, Nilgai, four horned deer, wild boar, crocodiles and many species of birds. The ride (16 km ) brings us to Ghanerao for lunch. Ghanerao castle, built in 1606 is run as a heritage property by the present Thakur. Though the facilities are basic, the grandeur of the castle with its Jaisalmer stone facade and its marble sitouts are interesting. An interesting walk around the village to view craftsmen and artists. Overnight castle Ghanerao. We ride back into the sanctuary, passing a crocodile lake and up a steep trail - climbing 2000 ft upto the Kumbhalgarh fort. This is a tough ride as riders will have to dismount on occasion to lead the horses up steep sections of the trail. The 20 km ride will take about 4 hrs. We arrive at the Aodhi hotel for lunch. The Aodhi is now professionally run by the Maharaja of Udaipur. Drive to Udaipur to board return flight to Delhi. Raj Risala offers you a unique experience of the glorious heritage of Rajasthan, land renowned for its history and deeds of chivalry, valour and courage. Traverse this timeless land on a leisurely safari in the footsteps of the Maharajas of yore, by horse or camel. 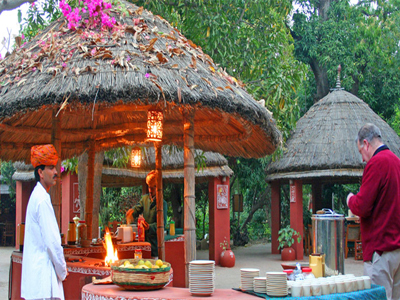 You will see and stay at exquisite forts and palaces or camp in grandeur. Visit wildlife parks and monuments which reverberate with history. Witness the art and culture of the land and its everchanging beauty. Above all meet the people whose hospitality and warmth will enchant and beckon you to come again. 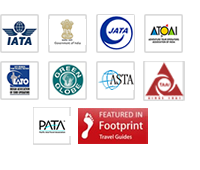 We have a varied number of itineraries to suit your convenience and we can further cater to any special itineraries as per your desire. The Raj Risala is based in the venerable and holy town of Pushkar just 7 hrs from Delhi and a gateway to this unique land. This ride is conducted in the Shekhawati region which is known as the Open Art Gallery due to the various Havelis which have fascinating wall frescoes on them. The base of this ride is from Dandled, a well known heritage hotel. 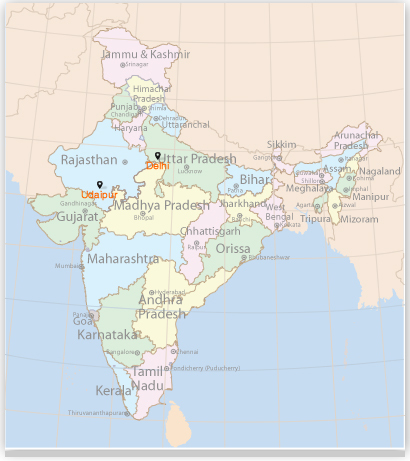 The terrain in this area consists of a mixture of green fields, sandy tracks, sand dune areas and finally to the Aravalli mountain range with flowing crystal clear streams and palm trees. 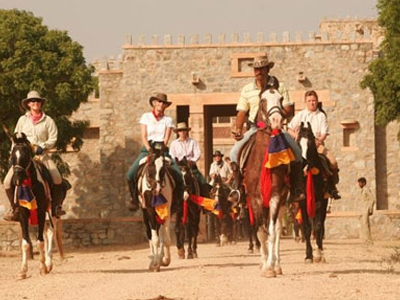 During this ride the group stays at famous heritage hotels at different forts and palaces. 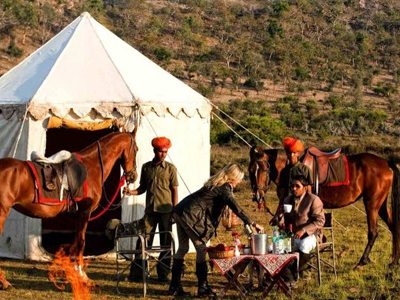 On the choice of the group tented camps at some places can be arranged. This ride is conducted in the desert of Bikaner, Nagaur and Jaisalmer areas. The vast desert of this area is known for it's undulating terrain, sparsely populated with the Indian Chinkara, black buck and the nomadic tribes of Rajasthan. During this ride, the group will stay at the home of a Raiput Chieftain and in tented camps with only one night stay at a lavishly designed heritage hotel.